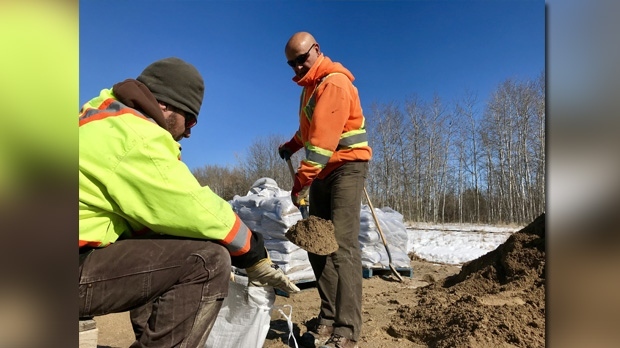 The Rural Municipality of St. Andrews has been busy in a fight against rising waters this weekend. Emergency coordinator Jim Stinson says water began rising about six inches every half hour Saturday evening on Netley Creek. Sunday he said it has slowed, but water is only two to three inches away from breaching some dikes. One bad area is around Chelsey Crescent. Stinson said Sunday morning an aircraft was able to fly over the area. Crews found an ice jam that runs from Goldeye Creek to about three kilometres north of Netley Creek. “Everything is coming from the Red. Netley runs into the Red,” he said in a phone call with CTV News. He said the municipality has 10 to 12 pumps going and several other property owners also working to hold back high water.